A 10-year old and his mother from upstate New York have had just about enough. 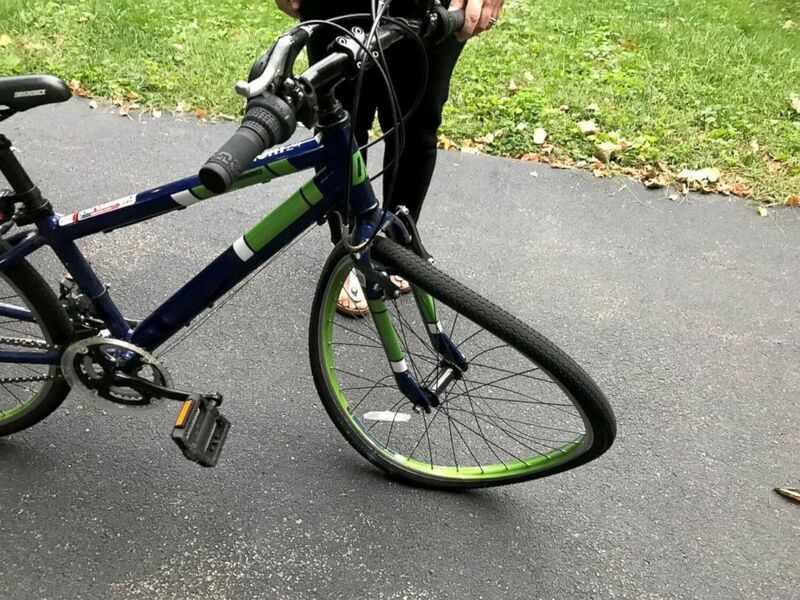 The family is considering legal action against a driver whose car collided with the boy’s bike, mangling the bicycle and throwing the boy to the ground screaming. The driver then left the scene of the accident without waiting for police, according to a police report, and later – under court order -- wrote what the boy and his mother consider a condescending and “sickening” letter of apology. Back in September, 10-year-old Julian Moore was riding his bicycle along the side of a road in Pittsford, New York when it collided with a white Ranger Rover that was attempting to pass him on the left. When Moore hit the ground he screamed, prompting numerous nearby residents to rush out to help him, according to the report – a copy of which was obtained by ABC News. 911 was called. Julian Moore's bicycle was damaged in a collision with driver Doug Lamb, according to police. Behind the wheel of the Range Rover was Doug Lamb, 66, who had just finished a round of golf at a nearby country club. Witnesses told police that Lamb was driving well within the speed limit, but no one saw the actual collision. Lamb got out of the car as neighbors rushed to aid the child, according to a police report. Soon, Moore’s mother arrived on the scene. An ambulance arrived six minutes after the 911 call was placed, according to the report. Moore’s mother Jenny assessed her son’s condition and declined further medical care from the ambulance paramedics. Dear Julian, I’m very sorry that you rode into the side of the car I was driving. Police arrived ten minutes later, according to 911 records cited in the police report – which means they were on the scene 16 minutes after the 911 call came in. Lamb later told police that he stuck around the accident scene for about 30 minutes, and after hearing Moore’s mother decline further medical assistance from the ambulance team, he left the scene. That’s not how others on the scene recalled the incident. 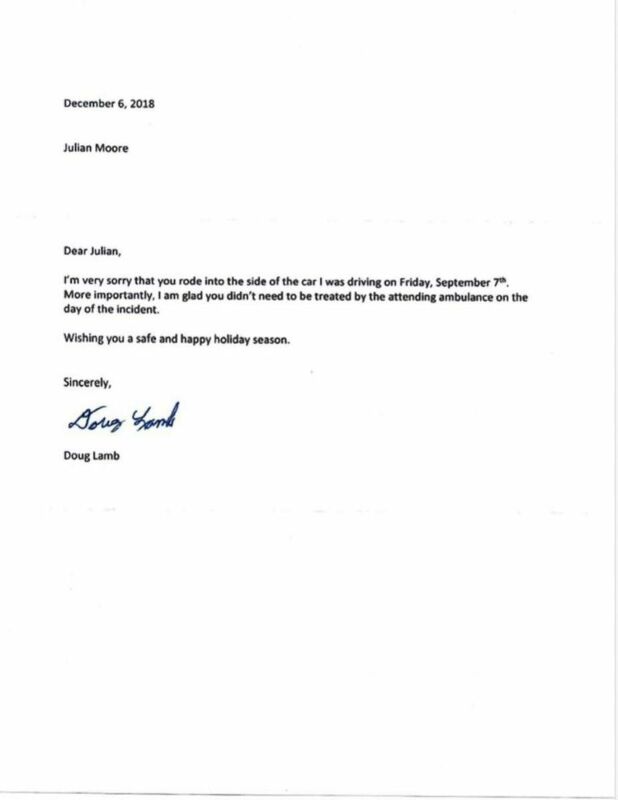 Lamb didn’t identify himself to Julian or Jenny Moore, or the ambulance crew, according to interviews with Moore and his mother. He did not identify himself to the ambulance paramedics, according to the police report. A judge ordered driver Doug Lamb to a write a letter of apology to Julian Moore, 10, after his car collided with the child's bicycle. By the time police arrived, he was gone. While the boy appeared to have suffered only minor scrapes and bruises, his mother said that he was later diagnosed with a mild concussion. It took police two weeks to track Lamb down and charge him with a misdemeanor for leaving the scene of an accident causing personal injury. Lamb didn't own the white Range Rover, according to the police report, but rather was driving it for a friend at the golf club who needed to pick up another car that was being repaired at a nearby dealership. When contacted by police, the owner of the Range Rover told police that Lamb "had never notified him of the accident." In December, Lamb went to Pittsford Town Court, seeking to have the charge dismissed. Prosecutors sought a sentence of community service and a requirement that Lamb make a written apology to Julian. The judge in the case ordered Lamb to write the letter of apology, but declined to order Lamb to complete community service. Julian said he was “angry” upon receiving the letter. Moore’s mother Jenny is even more upset. She said a doctor driving behind Lamb approached the boy as he lay on the road. When she realized that the driver had left the scene without identifying himself, she said she could barely believe it. “Honestly?” she continued. “I’m considering [legal action]. At this point it’s so different from what it was at the time. I could never have thought, I would never have considered any legal action if he had apologized, if he had come forward [at the time of the accident], if he didn’t leave the scene and evade responsibility -- I would have accepted an apology, a real one.